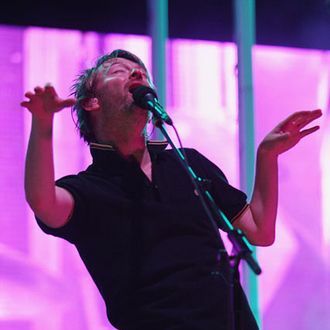 If the internet is good for anything, it’s conjuring up Radiohead rumors. A new album may or may not come out in June, Paul Thomas Anderson may or may not have shot a music video with the band … etc. Between the new company they started and the massive tour they’re embarking on in a few weeks, Radiohead has been awful busy lately, and it appears that they’ve officially begun building hype for the purported upcoming album: U.K. fans report receiving creepy, ominous leaflets — yes, as in tangible, snail-mail-sent paper products, which were widely used before the advent of the internet — festooned with lyrics from the long-gestating song “Burn the Witch” and an official Radiohead logo. The lyrics read, “Sing a song of sixpence that goes/Burn the Witch/We know where you live.” The song was first teased by Stanley Donwood’s art for 2003’s Hail to the Thief, and the opening chords have been played by Thom Yorke & Co. at least twice, in 2006 and 2008. The lyrics appeared on the band’s site in 2007, though the song has been presumably percolating in a cauldron for a decade. You can see the leaflet, and hear a very brief snippet of the song’s opening chords, below.